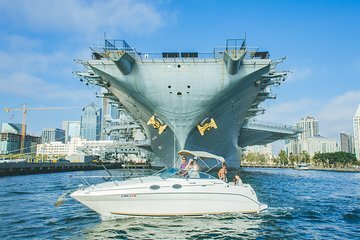 Experience San Diego Bay by motorboat on a 1.5-hour private tour that is ideal for groups of family and friends. Look out for southern California’s marine wildlife, and get a close look at military ships and the coastline. Your captain provides water and snacks, and you can bring your own food and beverages aboard the well-equipped boat, which has a bathroom, outdoor deck and indoor cabin, and bluetooth speakers for your music.